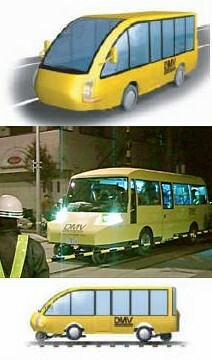 A dual-mode vehicle (DMV) that looks like a minibus and runs both on conventional railway tracks and paved roads was tested on the Gakunan railway in Fuji city (Shizuoka prefecture) on the night of November 24. The 28-passenger test vehicle was developed by the Hokkaido Railway Company (JR Hokkaido) in a project that began in 2000. Technicians aboard the DMV evaluated the safety and ride quality during the series of tests on rail and road. After the 3-km railway portion of the test course, the vehicle stopped at a railroad crossing, retracted the railroad wheels and switched to street mode in a mere 10 seconds. A number of local governments around Japan have shown interest in introducing DMVs because they are inexpensive to manufacture and run. In addition, DMVs conveniently allow passengers to travel from train stations to their final destinations without having to transfer vehicles. DMVs appear to be particularly attractive in rural areas with limited public transportation because they allow railways to offer more versatile and efficient services. In April 2007, JR Hokkaido will begin operating DMVs along part of the Kushiro line in eastern Hokkaido.